The Inspector, Jonathan Manning, has written to Hart Council. His letter comes in advance of his full Inspection Report, which is due in the next few weeks. In it, the Inspectors instructs Hart to remove the New Settlement at Winchfield/Murrell Green from the Local Plan. The reason given is that a New Settlement is not required to meet the housing need. This is very good news. The full letter (called EXAM 60) is available here. In other words the threat of an unnecessary New Settlement has not gone away, and the Council seems as determined as ever to develop a new settlement as soon as possible, as a way to block the regeneration of Fleet and the other urban centres. a) the most urgent need for Hart is to regenerate its town centres (especially Fleet). Thus reversing the commercial decline of the whole district. b) the regeneration of Fleet and the other town centres with mixed-use (residential, retail and leisure) developments has the potential to deliver enough new housing. This obviates the need for any major greenfield developments in the foreseeable future. And it is not enough to make this case to the Council. We have to convince the general public. Fleet and the other urban centres can accommodate the bulk of the new housing requirement, whilst at the same time becoming more attractive places to live and work. We need to study the Inspector’s Full Report, once it is available, to see what detailed changes he has recommended to the Local Plan. We will look particularly for policies on Town Centre development (ED5). Once we have done this we will be able to formulate a plan of action to protect our countryside and rural villages. We have taken an important step forward today. Thank you as always for your support. The Whitewater Valley Preservation Society registers its objection on behalf of our members to the above application. The Society believes the proposed development would have a detrimental impact upon the Whitewater Valley and would damage the rural character of the valley. We wish to identify the risks to the River Whitewater from water courses, including a tributary of the River Whitewater which crosses the site, which run into the Whitewater and are already subject to flooding. The development as proposed would adversely affect two Conservation Areas – those of North Warnborough & Basingstoke Canal – and a Site of Special Scientific Interest (SSSI), the Basingstoke Canal. The proposed development raises issues regarding the rich biodiversity and ecology of the SSSI and the historic landscape, contrary to the National Planning Policy Framework (NPPF) paragraph 109. As required by the Environment Agency and the Ecological Appraisal provided, a 10m buffer zone – which is free from lighting and domestic gardens and landscaping – must be implemented. 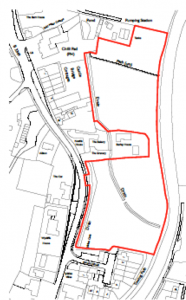 The Society objects to a link road between the two halves of the site, which intrudes on what should be an undeveloped buffer zone, and is a footpath in the neighbourhood plan. The Society also objects to the proposed layout, which would develop a suggested undeveloped area identified in the Odiham & North Warnborough Neighbourhood Plan, which would help preserve important views across the site from the Basingstoke Canal. The River Whitewater is an identified Site of Interest for Nature Conservation (SINC) and is already failing to meet Good Ecological Status (GES) as identified by successive Riverfly Censuses commissioned by the Society. 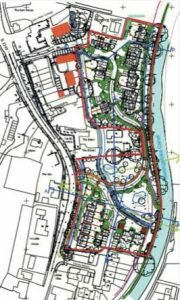 As GES is required to be met under the Water Framework Directive, there is a real concern that additional pollution will inevitably result if the application as proposed were to proceed in addition to already granted development at the Chilli Pad and being sought to the rear of Castle Bridge cottages. The GES status is not recorded when considering Water Quality in the Flood Risk Assessment and Drainage Statement. Neighbouring residents have submitted copious evidence and case studies, which demonstrate the existing surface flood risk experienced regularly on this site and surrounding lower elevation sites adjacent which include many listed buildings. These flood events are not recorded in the Historical Flooding report in the Flood Risk Assessment and Drainage Statement provided by the developer. Moreover, this development raises issues regarding the structural integrity of the Canal, which can only further increase the risk of major flooding events on a site that is lower than the canal and undercuts its 225 year old structure. Climate change will further increase the flood risk as we expect more frequent and severe storm events. The Environment Agency guidance recommends +70% for peak riverflow allowances for the Thames River Basin, in which the River Whitewater is situated, over the lifetime of the development. The Flood Risk Assessment and Drainage Statement provided by the applicant is inadequate for a sensitive site in the flood plain of the River Whitewater. All the above matters and environmental impacts are exacerbated by the applicant continuing to propose substantially more houses for the site than the Odiham & North Warnborough Neighbourhood Plan proposed. Please see the attached leaflet, produced by local residents. WVPS supported the Rural Hart Association in opposing the proposal from Hart District to include in the new Local Plan a “New settlement” in the Winchfield/Murrell Green area. Murrell Green sits on the River Whitewater. The 10 day Examination-in-Public of the Local Plan finished just before Christmas, and the Inspector, Jonathan Manning, is now writing up his report which is due to be delivered to Hart sometime in February. The Inspector, Jonathan Manning, was very thorough and fair. He had done his homework, and was quick to detect flannel and to insist on accurate answers to his questions. But he also found time to let everyone have their say. I think we can be confident of a fair report. The Rural Hart Association was invited to participate in Matter 3 (Housing: The Objectively Assessed Need), Matter 4 (Housing: Spatial Distribution) and Matter 10 (Retail and Town Centres). RHA was represented by Mark Dodds (Director of Planning and Development at Lambert Smith Hampton) and me. Winchfield Parish Council and their consultants were invited to participate in most of the twelve Matters, so between us we were able to represent the interests of rural Hart across the whole spectrum of the Local Plan. The Inspector pushed Hart hard to demonstrate that their Sustainability Appraisal was adequate to justify the Local Plan and, in particular, the choice of Murrell Green/Winchfield over alternative sites for a New Settlement. The Inspector did not seem to be impressed with Hart’s response, and if he finds the Sustainability Assessment unsatisfactory then this is likely to lead to a recommendation for significant changes to the Local Plan (see conclusions below), or a significant delay while the Sustainability Appraisal is re-worked. There was a fairly even split between those who want the housing numbers to be higher (mostly the developers) and those who want them to be lower (those who oppose building on greenfield sites and want to keep Hart rural). It’s hard to predict what the Inspector will recommend, but probably not a substantial change to Hart’s recommendation of 388 new dwellings per annum for the plan period. This was a key session where Hart’s decision to commit to a New Settlement in Winchfield/Murrell Green came under severe pressure from the Inspector who asked how Hart could possibly commit to a specific site when there was no satisfactory evidence that the plan was ‘deliverable’ or that the site was better than any alternative site. Hart’s defence was basically that the New Settlement strategy (SS3) was not yet a plan for a New Settlement, but just a strategy to find a New Settlement within the Winchfield/Murrell Green area of search. But this seemed to cut no ice with the Inspector who said that if there was as yet no site for the New Settlement then it was even less possible for Hart to know that it was a better site than any of the alternatives. In this session we (RHA) were able to make our case that the regeneration of Fleet and the other urban areas with mixed-use (residential, retail and leisure) developments could provide a significant number of new houses (over 1000 in Fleet Town Centre) and at the same time reverse the long-term decline of Fleet as a vibrant and commercially-successful town centre (a trend which Hart acknowledges in the Local Plan). We were further able to demonstrate that such mixed-use developments could attract private investment (based on the response of developers to RHA’s plan to regenerate the Hart Shopping centre). And finally we stressed that Hart’s premature committment to a New Settlement was a barrier to the regeneration of Fleet (because developers are reluctant to invest in regeneration schemes which are not actively promoted by the Council in the Local Plan). I am sorry to say that the Inspector did not grill Hart very hard about their failure to provide a convincing plan to regenerate Fleet or the other urban centres. Nor did he clearly acknowledge that the plan for a New Settlement (which is not needed in the Plan Period) would be a barrier to regenerating Fleet (which Hart accepts is needed in the Plan Period). However, he did challenge Hart to justify why their policy to regenerate Fleet was so short on substance, and why it excluded the possibility of residential development. And he also asked Hart to include the consideration of residential development in the plan for Fleet (ED5). The Infrastructure session was important for RHA’s cause because the Inspector questioned whether Hart’s Infrastructure Development Plan demonstrated a sound understanding of the infrastructure costs of the Plan, and in particular the plan for a New Settlement in the Winchfield/ Murrell Green area of search. Hart had to fall back again on the mitigation that the infrastructure costs of SS3 could not be known at this stage because the site of the New Settlement was still unknown within the area of search. This allowed the Inspector to ask again how, if the infrastructure costs were unknown, Hart could know whether a New Settlement in the Winchfield/Murrell Green area was a better proposition then the alternatives. The Inspector clearly feels that SS3 is too prescriptive (when the quality of supporting evidence is so poor). So his recommendations are likely to soften the categorical nature of SS3 (“Permission will be granted for a New Settlement in the Winchfield/Murrell Green area of search” etc). The Inspector asked Hart at several points in the Examination whether it would be practical to delay the decision to embark on a New Settlement until the first review of the Local Plan at the five year point (c. 2024) or even, if necessary, to bring forward the review by a couple of years to say 2022. Based on the Inspector’s serious concerns about the quality of the evidence justifying a New Settlement in the Winchfield/Murrell Green area, it seems possible that the Inspector may recommend that any commitment to a New Settlement should be removed from the Plan at this stage, and reviewed after a few years. A delay to the decision about the New Settlement for a few years may not sound like much of a result, but it would be a significant step forward, especially if the delay was linked to a requirement to assess the regeneration of Fleet (and the other urban centres) as an alternative source of new housing. A delay would also put pressure on Hart and Fleet Town Council to accept the growing realisation across the UK that mixed-use redevelopment of Town Centres is the best way to reverse their decline. We must now wait and see what the Inspector’s report recommends. But in the meantime, Fleet Town Council’s plan to build a new Theatre complex on Gurkha Square (to replace the Harlington Centre) has been withdrawn as a result of Fleet residents’ strong objection to funding the theatre out of Council Tax for the next thirty or forty years. This represents a good opportunity for Fleet residents to a) put pressure on Hart and Fleet Town Council to recognise that developers are prepared to fund leisure facilities as part of a mixed-use residential development and b) to encourage the Council to back the scheme to redevelop the Hart Shopping Centre (which includes a commercial cinema). I am very grateful for the generous contributions that so many of you have made towards the Design Study for the Regeneration of Fleet. A summary of the Design Study is here, but please let me know if you want to see the full report – it’s too bid to attach to this email without causing a lot of delivery failures. The Design Study has demonstrated convincingly that Fleet can be regenerated without taxpayers support with mixed-use developments which would provide additional affordable homes, improved retail facilities, extra public spaces and leisure facilities. Furthermore, Lambert Smith Hampton has now had two expressions of interest from developers who would like to invest in the proposal, but only if Hart’s Local Plan is modified to express a commitment to working with developers to bring forward such a scheme. The Rural Hart Association (RHA) has made very good progress over the summer. The RHA has decided to concentrate its resources on the single issue of regeneration of Fleet town centre. The RHA set out to demonstrate that it is feasible to regenerate Fleet Town Centre with a mixed-use development (residential, retail and leisure), which would provide housing as well as reviving the commercial viability of Fleet as Hart District’s largest town. Regeneration of Fleet is of vital importance because Hart District Council’s justification for a New Town rests on their assertion that regeneration of Fleet can’t be achieved. But Hart District Council has made no attempt to secure the investment needed to regenerate Fleet. When challenged on this at the January council meeting Hart District Council stated that regeneration of Fleet was an “impossible pipe-dream”. In May, RHA appointed Lambert Smith Hampton to undertake a Design Report to investigate the feasibility of a mixed-use regeneration of Fleet’s Hart Shopping Centre. Hart Shopping Centre can be regenerated to provide the same retail and parking space, as well as 950 square metres of community space, a multi-screen cinema and 371 flats (of 1, 2 and 3 bedrooms). The whole area would become modern and desirable, and the flats would provide a tremendous boost to the viability of the shopping centre. The return on investment for the developers looks good, and Lambert Smith Hampton has already generated serious interest from several potential developers. In addition the site owners approve of the scheme and discussions between the site owners and the developers are scheduled for late in the year. In summary, RHA has demonstrated that Hart’s claim that Fleet cannot be generated is utterly wrong, and has resulted in a Local Plan which condemns Fleet in particular (and the whole Hart in general) to long-term economic decline. The Rural Hart Association is now fully prepared to play its part in opposing a New Town at the Examination in Public of Hart District Council’s Local Plan which starts on 20 November. We hope that on the basis of this Study, the Inspector will rule that the Local Plan is unsound and that he will recommend that the New Town is removed from the Plan and that a large-scale regeneration of Fleet is undertaken instead. The regeneration of Fleet will pave the way for a bright future in which Fleet becomes a modern, vibrant and commercially successful town surrounded by beautiful countryside and rural villages. Over the next few days Lambert Smith Hampton will submit the Design Study to Hart District Council, and ask the Council to cooperate in its implementation. Lambert Smith Hampton will also submitted the Design Study to the Inspector in preparation for the Inspector’s review of the Spatial Distribution of Housing (Matter 4) and Town Centre and Retail (Matter 10). In parallel some Fleet members of the RHA will submit the Design Study to Fleet District Council, whose Neighbourhood Plan supports mixed-use developments in the Town Centre. The We Heart Hart blog also provides a full commentary of the progress of the Local Plan and it is well worth reading. Thank you to all those who have contributed so generously to this work of the RHA so far. However RHA is still about £8,000 short of the funds that we think we will need for Lambert Smith Hampton to represent us at the Inspection. or you can send cheques (made payable to The Rural Hart Association) to the Treasurer, Southview Cottage, Heckfield, Hook, RG27 0JY or contact the Treasurer via email. I think that we have built a very strong case, and I believe that we have a good chance of preserving all of our green fields for many decades to come. Our Hart & Rushmoor countryside is a valuable resource – is it worth protecting? at: Church on the Heath, Elvetham Heath, Fleet, GU51 1 HA. Join former CPRE Chairman Peter Wain and CPRE Hampshire for an evening of discussion about our countryside and have your say on future campaigns for the area. To book your free place, please visit CPRE Hampshire, email admin@cprehampshire.co.uk, or call 01962 841897. CPRE Hampshire is the Hampshire branch of CPRE, the Campaign to Protect Rural England. This post gives guidance on how to respond to the Hart Draft Local Plan (Regulation 18) Consultation. The consultation is open until 5pm on Friday 9th June 2017. With just two days to go, it is important to send your views in now. Option 1: You can find the full version of our suggested response to the consultation here: WVPS responses to Hart Local Plan consultation. Please download the document, edit it into your own words and send to planningpolicy@hart.gov.uk before the deadline. Option 2: Alternatively, you may wish to comment using the online form. However please note you will only have 45 minutes and your changes cannot be saved and returned to later. The draft Local Plan has been heavily criticised by the Campaign to Protect Rural England, We Heart Hart, as well as the Whitewater Valley Preservation Society. The need to support the policy for Local Gaps (support Draft Local Plan page 48, policy MG6, paragraph 158, particularly those in the Whitewater Valley: x Murrell Green to Hook, xii North Warnborough to Greywell and xiii Odiham to North Warnborough). You may also challenge the sustainability assessment that ranks Winchfield as the next best green field option (comment on the Sustainability Appraisal page 27 section 8.2). The Whitewater Valley Preservation Society today publishes its WVPS responses to Hart Local Plan consultation. Does not respect the separate character and identity of Hart settlements. Fails to protect or enhance water quality and ecological status of water bodies. Many of these already fail to meet the standards set by the Water Framework Directive. Fails to protect or enhance biodiversity by plans to develop on greenfield sites. Fails to protect and enhance the district’s green infrastructure. Incorrectly identifies an inflated target of over 10,000 new homes. The draft plan will not deliver Hart’s vision for the district to remain an attractive, largely rural area. The plan does not protect or enhance the character and quality of natural assets. The proposed greenfield developments fail to enhance the quality of life and sustain the environment. The Valley of the River Whitewater will be seriously degraded by proposed developments, such as Murrell Green. This site sits squarely in the middle of the valley. The draft plan omits measures to protect and enhance the river and its valley. The draft plan incorrectly identifies a target of over 10,000 new homes in order to satisfy an affordable homes target. There are other means to satisfy the affordable homes target. These include regenerating Fleet town centre and planning for a more realistic use of existing unused office sites. The plan forces greenfield developments, which fail to protect and enhance the natural environment. The greenfield sites selected will have a detrimental impact on, and cause long term erosion of, the rural character of Hart district. If the housing numbers had not been exaggerated and inflated, the plan would not need Murrell Green with all its problems. The Whitewater Valley Preservation Society supports policies for gaps between settlements. Gaps located in the Whitewater Valley include: Murrell Green to Hook; North Warnborough to Greywell; Odiham to North Warnborough. However the Murrell Green proposed new development will inevitably threaten the coalescence of Hook and Hartley Wintney, despite the proposed gaps. The draft plan fails to protect the Landscape, Biodiversity and Geodiversity in the sensitive Whitewater Valley. It also fails to protect the unique ecology of the chalk stream. Hampshire’s chalk streams are an important habitat at national and international level. The River Whitewater already fails to meet its Water Framework Directive classification of Good Ecological Status. The developments at North-East Hook and now proposed at Murrell Green will inevitably lead to further deterioration in the river ecology. Hart District Council must show how the plan’s targets for biodiversity can be met if sites such as Murrell Green are proposed. The Society concludes that the draft plan appears to set out to undermine the natural environment by over-increasing the built environment.